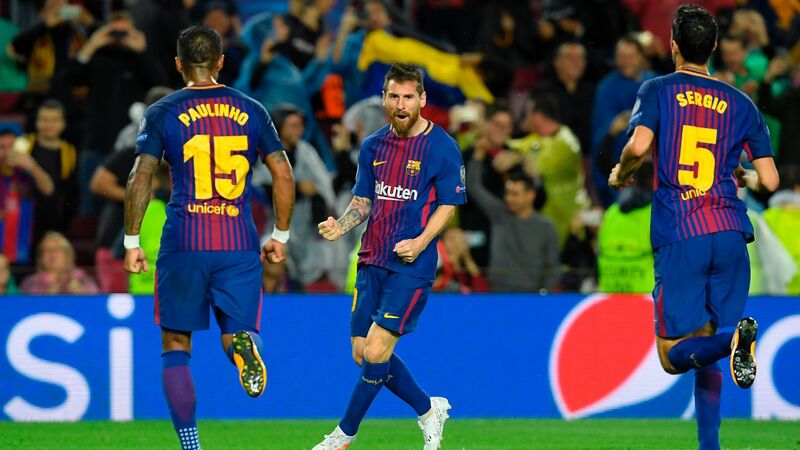 Barcelona strolled to within striking distance of the last 16 of the Champions League by easily beating a woefully mismatched Olympiakos 3-1 even after having Gerard Pique sent off before the end of the first half. Lionel Messi’s 100th goal in European competitions, a trademark curling free kick, got the biggest cheer on a flat night at Camp Nou conditioned by the torrential rain in the Catalan capital and opponents who barely showed up. Barca benefitted from an own goal for the fifth time this season as they took the lead when 19-year-old visiting defender Dimitris Nikolaou diverted Gerard Deulofeu’s cross into his own net. Lucas Digne struck his first Champions League goal for the club to stretch Barca’s lead, while Nikolaou had the final say by scoring a consolation goal for the hapless visitors. Barca are on the brink of the latter stages of the competition and barely had to break stride here. Digne looked confident and for the first time in a while and took advantage of his place in the starting lineup, while another record for Messi can do the free-scoring Argentine no harm. Barca lost their perfect defensive record in Europe when Nikolaou struck late, while Pique’s lacklustre displays are a cause for concern. The Spain international is suspended for the return game in Athens, but on this evidence, Olympiakos are still unlikely to trouble Barca without him. 7 — Ernesto Valverde showed little mercy toward his beloved former club, only resting Ivan Rakitic and Nelson Semedo, with Jordi Alba forced out with injury. He switched formation from the 4-4-2 he has used recently to give Deulofeu an opportunity, although his hands were tied by Pique’s untimely red card, and he naturally prioritised plugging the hole in defence, to the misfortune of the former Everton forward. GK Marc-Andre ter Stegen, 6 — Was a passenger for most of the game as the shy visitors offered almost no threat in attack, and there was little he could do about Nikolaou’s bullet header at the end. DF Sergi Roberto, 6 — Linked up well with Deulofeu down the right-hand side in the first half but was forced to be more conservative in the second half with his team down to 10 men. DF Gerard Pique, 3 — His clumsy display got him sent off for the fifth time in his career, the first in the Champions League and for the first time in five seasons. He angrily protested referee Willie Collum giving him a second yellow card for slapping the ball into the net, but really, there was little case for his defence. Fortunately for Barca, Olympiakos were in no position to take advantage despite having the entire second half with an extra man. DF Samuel Umtiti, 7 — As calm in possession as ever, and he was easily able to snuff out any whiff of danger on the very rare occasion the Greeks came forward. DF Lucas Digne, 7 — Made only his second start of the season but looked far more confident than usual, perhaps lifted by playing 180 minutes earlier in the month with France. Took his goal superbly with a thumping low finish. MF Paulinho, 7 — The Brazilian talked before the game of his joy at working his socks off for the benefit of Messi, and he could certainly not be accused of conserving energy tonight, although he should have done better with his header which struck the bar. Lionel Messi’s free kick gave him 100 European goals, making him the first to score a century in Europe with one club. MF Sergio Busquets, 7 — Exerted his usual control, which was barely under threat even with 10 men. MF Andres Iniesta, 7 — Barely had to go beyond walking pace due to the weakness of the opposition but still dictated the pace of the game. FW Gerard Deulofeu, 7 — Made his first start in a month and was one of Barca’s liveliest players in the first half, putting in a remarkable 11 crosses, more than the record by any Barca player over 90 minutes. One of those crosses was too much for Nikolaou, but despite helping break the deadlock, the Catalan was the first to be sacrificed after Pique had been sent off. FW Luis Suarez, 5 — His crucial late equaliser at Atletico unfortunately didn’t have the desired effect on his confidence, and he still lacked sharpness, although he made up for it in effort and battling for every ball. FW Lionel Messi, 7 — The Argentine reached another milestone in racking up 100 European goals, but the flatness of the occasion meant he didn’t need to raise his game. Still, he got a dormant crowd to their feet with his awesome free kick and delighted them again by dancing his way through the visiting defence to tee up Digne. DF Javier Mascherano (for Pique), 6 — Would not have expected to play 45 minutes after starting on the bench but had a very comfortable evening. MF Ivan Rakitic (for Iniesta), 6 — Played in a deeper role than usual as Barca took their foot off the gas when he came on after Digne had put the result beyond doubt. MF Andre Gomes (for Busquets), NR — The Portuguese was one of the most criticized players against Atletico but had a far easier ride here as he helped see out a game that was already settled.